I found a fabulous "planets in outer space" print on the online shop "Fabric.com". It's perfect for the "attic window" quilt block. I used bright orange and yellow for the border and window "lattice", pulling out the oranges and yellows from the print. It's pretty bright! For backing, I chose plain navy homespun. With such wildly contrasting colours on the top (and the navy backing), it took me a while to decide how to quilt this one. 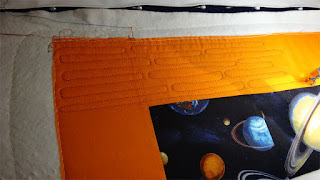 I didn't want the quilting to overpower or obscure the print and block patterns, so I opted to use two different colours of thread for the quilting: orange (over the orange borders) and navy (in over the planet print). 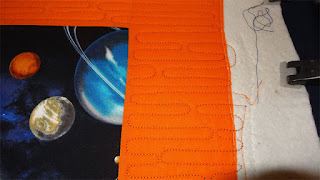 With the backing done in solid navy, I decided to experiment with orange thread on top and navy in the bobbin. But what should I quilt first? The border or the blocks? 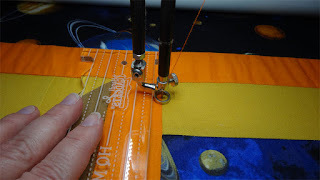 I decided to do the border first - and used a free-motion pattern from Angela Walters' free motion book "Shape by Shape". The pattern I chose is her "Back-and-Forth Lines", which I hoped would look like "space waves". This is my first time doing this pattern, and I found it fairly challenging to stay even and neat - but once I'd finished the border, the results look great, even where I've not been as consistent as I'd have liked. I was using a cheap thread (another experiment), and had to use a large needle (size 18) to keep the thread from shredding. Because of the large needle, the bottom thread is coming through on the top - little navy dots along the orange line. For this quilt it doesn't matter; it actually adds to the "outer space" theme (Morse Code?). I managed to get the orange area quilted, but did have to restart the thread several times due to breakage. 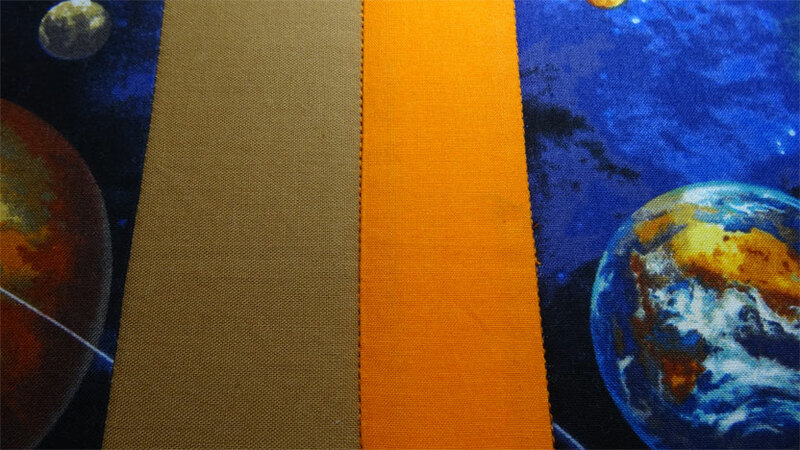 My conclusion is that cheap thread is more trouble than it's worth on the longarm. I won't do that again. I kept close control over the quilt as I advanced it on the frame, and kept it pulled a little tighter on the frame than I ordinarily would. I was worried that the center blocks would end up not laying properly after doing the edges. If I had it to do over, I'd do the center and work outward. The quilt turned out OK, but it was too difficult working from the outside and moving inward. I won't do that again. For the internal blocks, I decided to use my new rulers. 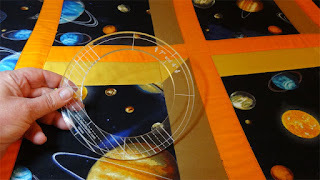 I'd played on scrap fabric first, of course, and watched several videos on YouTube about how to work with rulers. Those videos and the practice runs turned out to be really valuable. 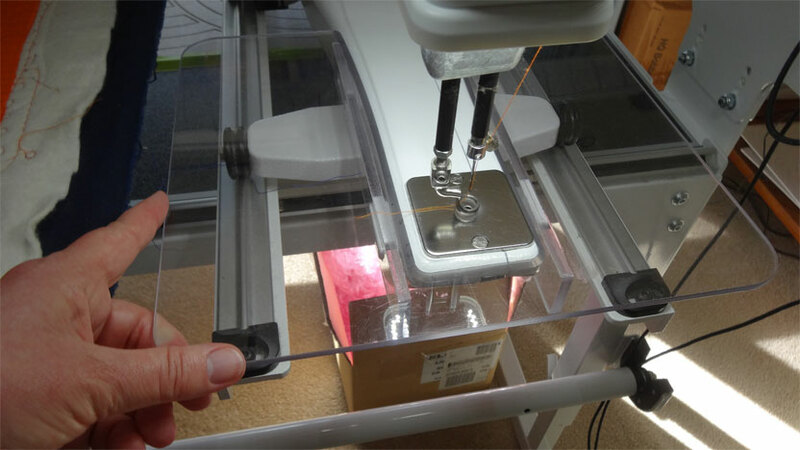 Here's the lucite ruler base needed for this kind of work. It pretty much just snaps over the machine base. And here we go - my first attempt - using a straight ruler and stitching in the ditch. The results: WOW! Have a look at the photo below. I have to admit I found it almost impossible to stay perfectly in the ditch. And I was using orange thread at this stage. The slightest slip to the right (into the blue print, especially) shows up like a scream. 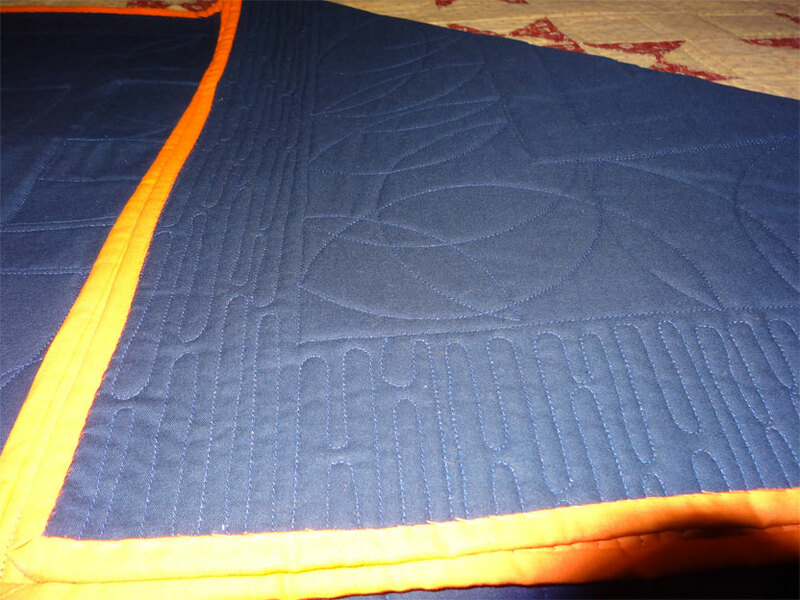 I found it better to switch to navy thread and quilt on the blue print just to the side of the seam. That was a lot easier to do and the few places where my line wasn't perfectly straight just don't really show up. 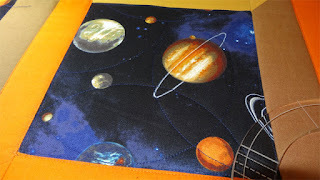 Now to quilt the areas where the planets print is. 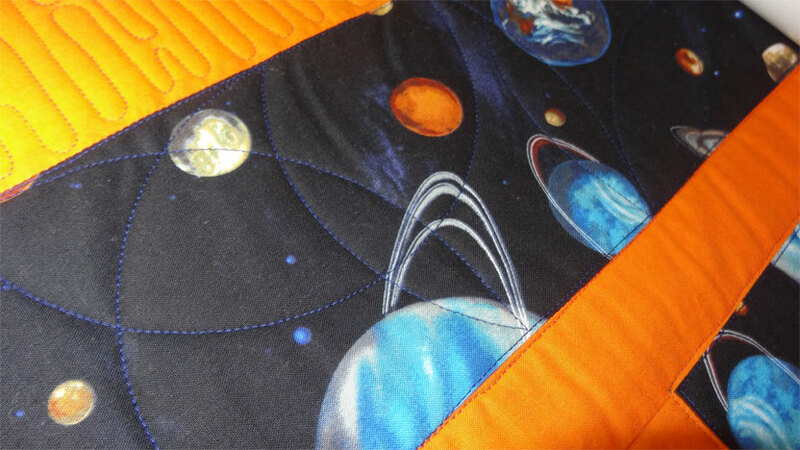 I needed a pattern to get the quilting dense enough so that the batting won't bunch up when it's washed - but I didn't want to quilt too much and possibly overwhelm the planet print. And here I've place the ruler to create an arc going from one edge of the border to the other. Here you can see how I used the round ruler to insert curves and arcs over the attic window blocks. And here's how I quilted the border. 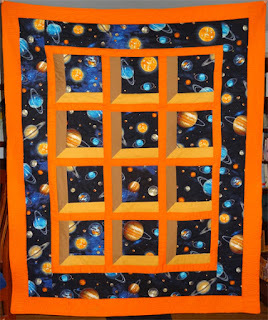 Here's the quilt back. It turned out great. There area few places where the orange thread shows up, but for the most part it's quite tidy looking. I found the rulers awkward at first and made quite a few mistakes. They don't really show up greatly on the quilt, but I know they are there. 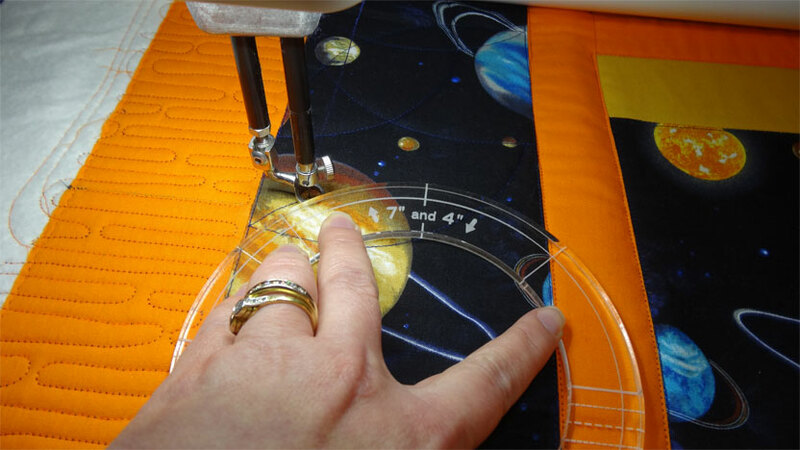 But by the time I'd finished this quilt, I had worked through my initial difficulties and, boy, I love those rulers! I'll be using them a lot in future projects.